Saturn is probably the most beautiful planet we have in our solar system. But did you know, Saturn is also home to a very peculiar phenomenon which has never been seen anywhere else before – a hexagonal hurricane. A hurricane in the shape of a hexagon (six-sided), not circle. If that doesn’t blow your mind, try this – the storm is an incredibly huge – 30,000 km across! And it is about 100 km deep, with winds of ammonia and hydrogen moving at more than 320 km per hour. It is large enough to swallow four planets of the size of Earth. This is what the Earth would look like if it were kept beside the storm. It’s only natural for hurricanes to be circular. 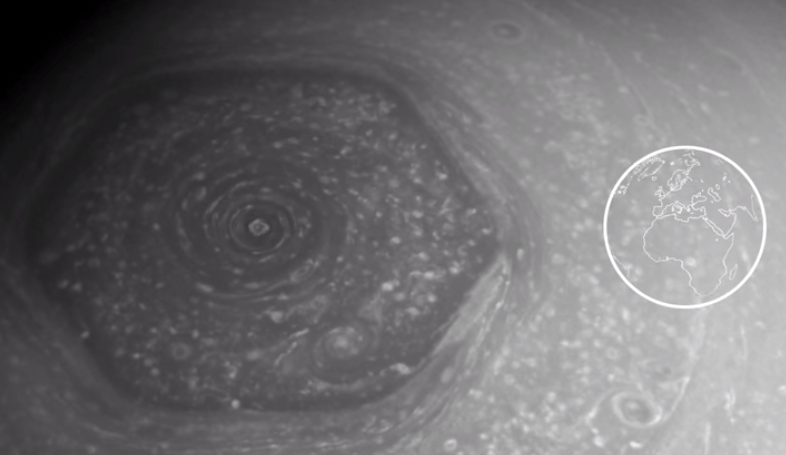 And yet, researchers at Ana Aguiar of Lisbon University have been able to show that the hexagonal storm raging in the north pole of Saturn is also very natural too. In the year 2010, they proved to by reproducing a similar effect in the laboratory by using rotating liquids. According to them, a very narrow jet stream that goes about the hurricane’s edge creates a couple of other tiny hurricanes. These little storms are the ones that push the larger hurricane’s borders and give it a hexagonal shape. In the 80s, the storm was first spotted by the twin voyager spacecraft.